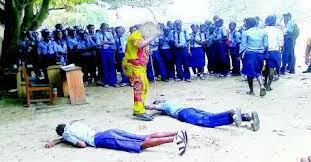 Miss Chidimma Ukachukwu aged 12 in Awka, Anambra State has died after being flogged by her teacher over homework. A reliable source in the school told the News Agency of Nigeria in Awka on Tuesday that the girl died on Thursday last week after she was flogged. The source explained that the girl fainted after being flogged severally by a female teacher and was subsequently rushed to an undisclosed hospital, where she died. The source also told NAN that the Commissioner for Education, Mrs. Uju Okeke, then ordered the closure of the school as a result of the incident. A NAN correspondent, who visited the girl’s family home, soon after she was buried on Tuesday in Awka, reports that the family was in grief.